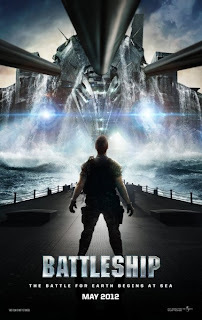 Essential plot rundown: Aliens must fight a battleship. So, this movie, as most all probably know, is based on a board game. And how do they do? I was a little disappointed. I was expecting something action packed like Transformers, but that did not happen. Most of the action is shown in the trailer. And while it was cool, it wasn't enough. But, I did like the aliens. They did have cool ships and cool technology. They had these scanner things that could detect the difference between people and machines, and they would use that to choose their targets. But they never explained why they would attack one thing but not another. I felt like there was a reason but it was never given. And that is really the only good about the movie. The first half hour is dedicated to "character development." But it was useless. We get to know the main character, and he is a douche. I didn't like him and it's hard to root for somebody you don't like. They try to get us to care by having a lot of people literally tell him "You have a lot of potential, but you are wasting it" (We never actually see this 'potential', we only know he has it because we are told) and by giving him a hot girlfriend. But that does't help. They even try to get us to care for his girlfriend by having her be a physical therapist for soldier amputees. But you still don't care for her. They even have a weak character arch with a soldier who is missing both his legs. I didn't care about him either. So, basically it is full of people that you don't care about. And with action movies, that is ok sometimes; but here it hurts. Somebody also discovers the aliens' weakness and they use that to defeat them. And it is totally unbelievable. It's worst than Independence Day. It feels force and doesn't really make any sense. And the ending was anti-climatic. However, I do applaud their efforts. They did try to somewhat follow the game. They have to fire on each other blindly and they use a grid system. So, there was more connecting them than just the name. And I give them props for that. And it was cool seeing naval combat. I haven't really seen a lot of that in movies, so that was a little refreshing. 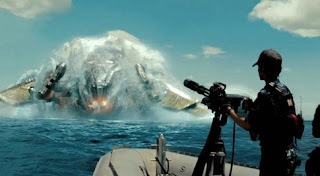 Does anybody know of a good movie that depicts naval warfare that they would recommend? So, overall it was an ok movie. The action was cool, but was a little sparse. The VFX were good for the most part; the aliens never quite look real. Battleship was not a waste of time, but you're not missing out if you don't watch it.